Making medieval manuscripts was a team activity, with different people taking on different roles in the production. Because of this, it’s not often that there’s evidence of a scribe also being the artist who penciled in the original drawings to accompany the text. In the case of the manuscript containing Sir Gawain and the Green Knight, Pearl, Cleanness, and Patience (British Library, MS Cotton Nero A.x), however, Maidie Hilmo has found there’s a good chance that both the words and the underdrawings came from the pen of the same person. Besides having an intimate relationship with the text, what other evidence suggests the writer and artist might have been the same? Using multispectral imaging, X-ray fluorescence, and pigment analysis, Dr. Paul Garside of the British Library confirmed to Hilmo that the underdrawings were consistent with iron gall ink, something that, Mark Clarke asserts, was abnormal for English drawings – but not for English text. That is, a scribe in England (where this manuscript is believed to have been produced) would consistently use iron gall ink, but an artist would not. A scribe/artist, however, might easily have simply used his own familiar ink for both. Finally, one of the important miniatures in the manuscript depicts Belshazzar’s Feast (found in Cleanness) and features the divine “Handwriting on the Wall”. Hilmo and Jane Roberts have observed that this handwriting bears a close resemblance to the scribe’s formal script found at various points throughout the manuscript. For the scribe to have placed the writing in the correct place for the miniature before it was sent off to a separate artist seems unlikely. It’s logical to conclude, then, that the writing in the picture was created with the drawing in the first place: by the scribe. Library, MS Cotton Nero A.x, folio 56/60v. 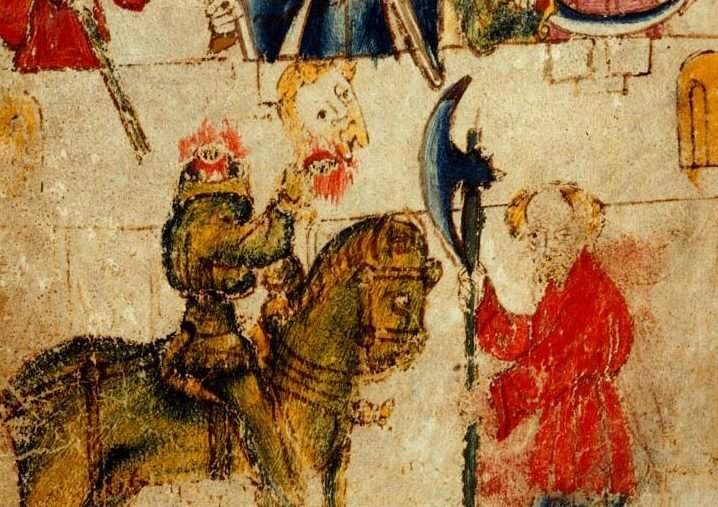 That the scribe and artist of the Gawain manuscript may have been one and the same person raises some interesting questions about this unique and famous manuscript. For the answers to more, have a look at Maidie Hilmo’s full paper, “Did the Scribe Draw the Miniatures in British Library, MS Cotton Nero A.x (The Pearl-Gawain Manuscript)?” in the Journal of the Early Book Society. You can learn more about the Gawain manuscript at the British Library or The Cotton Nero A.x. Project.